In this post-apocalyptic novel, everyone starts out as “littlies”. When they hit the ungainly pre-teen years, they are called “uglies”. And, on the day they turn sixteen, they have the operation: the surgery that transforms them them from a lowly, dorm-living ugly, to one of the “pretties”. Tally can’t wait for her birthday, for the day she will be freed from her imperfections and go join her friends in New Pretty Town, where it’s all about parties and having fun. Things aren’t as they seem, though. Tally’s friend Shay is vehemently opposed to the surgery. She says she wants to stay the way she is, and not be changed by the authorities. The ominous thing about the surgery is that some believe that it isn’t just appearances that are changed under the knife: personalities change, too. People become more pliable, agreeable, even sheep-like. In order to avoid her surgery, Shay plans a daring escape, to the Smoke, a city of people living off the land, who have all somehow escaped the cosmetic surgery. Shay escapes, but the authorities are suspicious. Special Circumstances, the elite pretties who run everything, pick her up and threaten her: Tally will never get her operation unless she agrees to lead the authorities to the city of Smoke. They intend to arrest and apprehend all of the people living there, considering them dangerous radicals who threaten the status quo. Tally is trapped: she desperately wants to be pretty, but she doesn’t want to betray a friend. Having no choice, she makes the journey through the wilderness and finds Smoke. When she gets there, though, she has second thoughts about blowing the whistle. She falls for a native Smokie, a boy who was born and raised in the outpost. Unfortunately, in trying to destroy the signal necklace that the Special Circumstances made her wear, she accidentally sets it off, and the police swoop in and arrest everyone. The first book in this trilogy ends in a daring rescue, as Tally sneaks into Special Circumstances headquarters in attempt to rescue those who were captured. I haven’t read the others yet, but I plan to. I’ll tell you all about them when I do. I love the premise of the book: this is a different sort of post-apocalyptic novel, not one plagued by scarcity and disease. It’s blissful and full of plenty. They look at the past humans, Rusties, as wasteful and slightly less intelligent beings, who brought about their own downfall by their dependence on oil. For me, the first hundred pages were a little slow-they were just about Tally’s life before the operation-but then I really got into the story. Just push past the first parts and you won’t be disappointed. 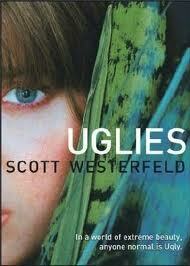 Westerfield, Scott. Uglies. New York: Simon Pulse Books, 2005. 448 pp. Ages 12 and up. If you liked this book, try the next two in the series: Pretties and Specials. Posted on May 21, 2011 February 1, 2012 by ShannaPosted in Adventure, ALA/YALSA Best Fiction for Young Adults, Futuristic, YA LitTagged beauty, conformity, cosmetic surgery, future, oil crisis, pranks, self-image.